Children’s Museum of Richmond, The Flying Squirrels, The Triangle Theater, Cultural Arts Center at Glen Allen, The Weinstein JCC, The Greater Richmond Chamber of Commerce, Richmond Ballet, The Visual Arts Center, Special Olympics, Maymont Foundation, SpeakUp5k. Both Dave Gallagher and David Fratkin are active on many boards in the Richmond community. Gallagher is currently on the boards of Benedictine Schools, The Visual Arts Center, Richmond Center Stage, the Greater Richmond Chamber of Commerce, and the Longwood University Business School Foundation. He formerly served on the boards of the Virginia Council of CEOs, the Children’s Museum of Richmond, and St. Bridget’s School. David Fratkin has served as president of The Payroll Group, a national industry association, and he is currently on the board of the Richmond Jewish Federation. Staying active and involved in the community, DP has annual team entries into the Monument Avenue 10k and the Color Me Rad 5k run. Since 2010, we have also sponsored a company-wide “DP Walk-Off” campaign. 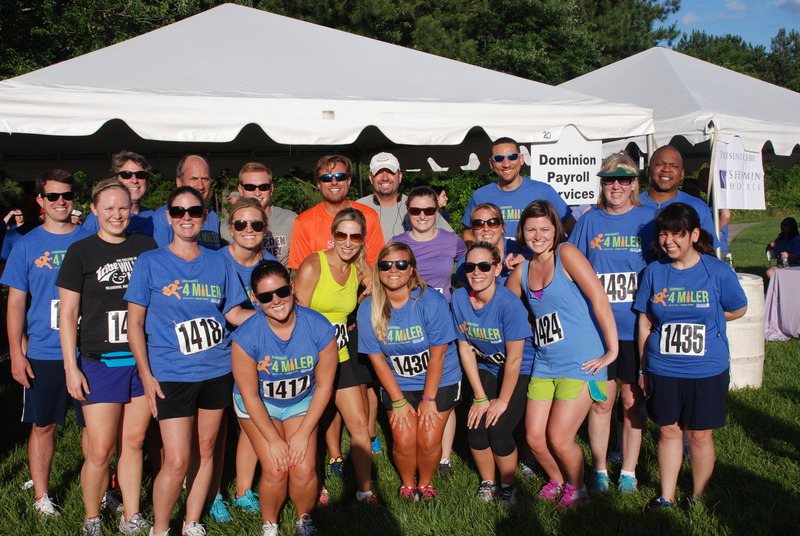 Recognized by the Richmond Sports Backers (Active RVA Community Award), this annual fundraiser involves DP employees grouping into teams and wearing pedometers in a competition to see which team accumulates the most steps. Each team adopts a local non-profit, and the winning team’s charity of choice receives a donation on their behalf. Employees at DP also have the option of taking one day per year PTO in order to contribute their day’s salary to a charity of their choice. From a humble beginning, Dominion Payroll has grown into the largest payroll company in the southeast and is widely considered to be the most innovative company in the industry. Our combination of payroll services with human resources assistance as well as our attention to customer service continues to propel us to the top of our industry. In 2014 Dominion Payroll partnered with Infinisource to co-develop iSolved, the Human Capital Managment tool at the center of our business. iSolved’s cloud-based software is scalable to any business and fully integrated allowing you to combine the resources and data of payroll, time and attendance, human resources and benefits administration in a single solution. iSolved allows us to continue to provide the level of service clients have come to expect more efficiently than ever before. Whenever there is a change in government regulations regarding taxation, employment, healthcare, or anything our clients need, Dominion Payroll proactively reaches out with solutions rather than expecting clients to inquire about solutions and/or do their own research. With the Affordible Care Act taking shape in 2015, DP is providing guidance and leadership for our clients through full capabilities to produce compliance reports as well as IRS taxforms 1094C and 1095C. Additionally DP continues to update our clients with educational seminars, client training classes and website articles all addressing the ACA. Dominion Payroll’s two owners have each served on one of the two boards leading the payroll business. Gallagher served on the Independent Payroll Providers Association (IPPA), and Fratkin served as president of The Payroll Group. In the last 6 months, representatives and owners from 6 different payroll providers across the country came to Richmond to visit Dominion Payroll to learn how to emulate our company. Since our inception in 2002, Dominion Payroll has maintained an annual gross sales increase of over 30% despite the worst economy in the last 80 years. We have also steadily increased the number of employees each year and have been named to the Inc. 5000 list of the fastest growing companies in the country, a distinction less than .01% of companies receive, for the last five years running. Dominion Payroll has contributed positively to the Richmond community by offering local businesses a local option for payroll services. To date, we have converted more than 1,500 mid-market companies to Dominion Payroll by taking business from large, national payroll providers and bringing that business back to Richmond, returning more revenue to the local economy and enabling us to offer career opportunities to local college graduates who want to remain in the community. Dominion Payroll also continues to promote Richmond careers through our highly successful summer intern program, which brings college students to DP for exposure to the payroll and human resource industry. “It has been a terrific program for us,” said David Gallagher, DP CEO. “We get a fresh perspective, some crucial added manpower, and the interns get an inside look at our industry. Hopefully, we’ll have some come back to us when they graduate,” Gallagher added. Inc 5000. 9 years in a row! Awarded to the fastest growing private business in America. Paychoice Outstanding Achievement Award – Platinum. 8 years in a row! iSolved Presidents Club Awards – 2019 Guardians at the Gate Award, 2019 Scholar Award, 2017 Active RVA Workplace Award, 2016 Most Companies on iSolved Platform, 2015 Highest Conversion Rate.